Home » All Stories » Let the countdown begin! ONPHA’s Conference and Trade Show is only four months away! In just four months, ONPHA will take over the Sheraton Centre Toronto for our annual Conference and Trade Show. The conference begins with Education Day on November 3, and formally starts on November 4. Online registration is now open – register before the early bird deadline (September 16) and save more than $100! This year’s theme is Let’s Grow Together! and we are looking forward to hosting more than 100 speakers who will participate in over 60 professional development sessions specifically geared towards non-profit housing professionals. This is the largest social housing conference in Canada! networking events: enjoy a night out on the town with your peers – we have organized group activities at discounted rates including a show at Second City, a night with sharks at Ripley’s Aquarium, and more. As we plan for the future, it is time to harness our collective knowledge! At this year’s conference, let’s share our stories, let’s learn from each other, but most of all – let’s grow together towards our common goals. 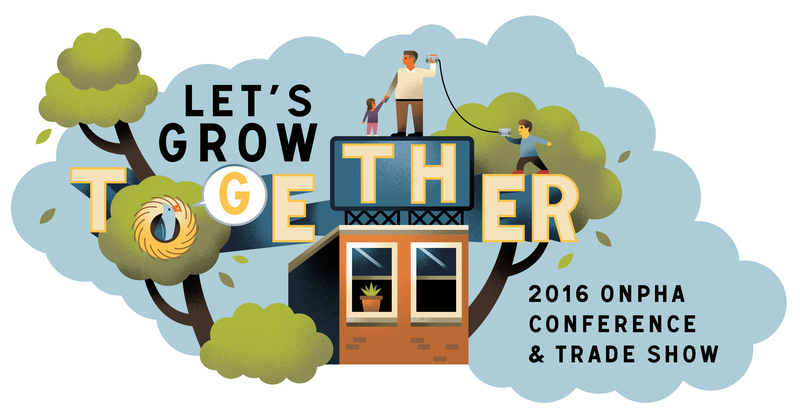 Learn more about the 2016 Conference as well as this year’s Education Day at conference.onpha.on.ca or contact us at conference@onpha.org or 416-927-9144. Register online today and be entered to win a one-night stay at the Sheraton Centre Toronto. Contest closes September 16.